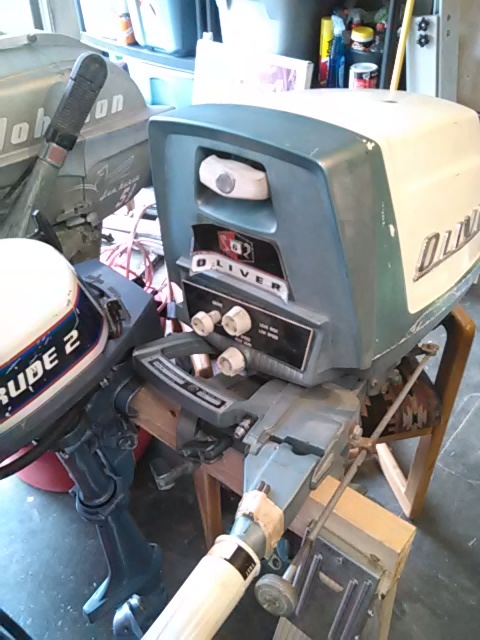 This came in a small job lot of outboards. It looks very hardly used. Takes 16/1 gas oil? Is there something that allows it to fire on that kind of syrup? Prop spins left instead of right. Looks fast and very deluxe. I read somewhere that there are a couple of problematic parts,, a bracket of sorts? Pretty sure this one isnt broken anywhere or any how. Gets tested soon I hope. Cool motor, must have been one of the last before they sold to Perkins. 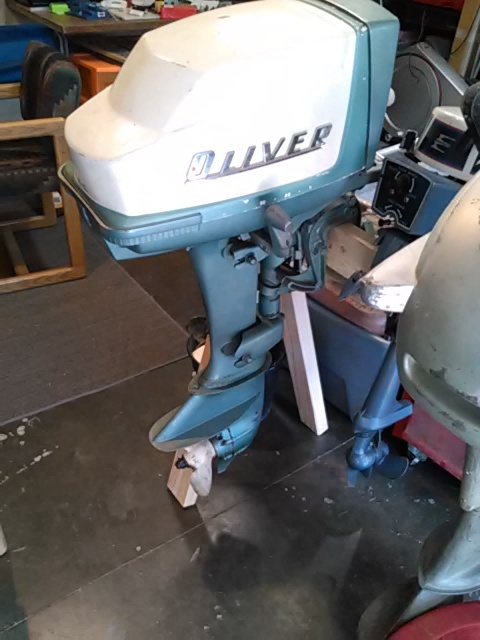 These originally started as Chris Craft motors, then Oliver bought them. I was wondering about this and the later models. It looks different from the earlier chriscraft motors, and from earlier oliver motors. This one looks to have the"tractor influence" in that it is very robustly built, and the individual meatal pieces seem very artistically designed. Wondering if perkins didnt have alot of design influence before buying the line?? Anyhow, the previous owner converted to an air compressor type fuel fitting, so thats easy enough to adapt. Ill double check oil and grease,, and see how she goes. So far Ive tested 2 other 6hp motors, and theres a world of difference between them. Will be interesting to see where the oliver falls in. From the Old Outboard Book by Peter Hunn: Chris Craft closed in late 1953, Oliver bought the company in 1954. In 1959, Perkins bought Oliver and shifted production to England. In 1961, label changed to Perkins. The red and black "crest" just below the starter confirms a 1959 model, since I do not see the earlier "Mohawk" model designation on the hood. 16:1 is the correct oil ratio, as I believe they were bushing motors. The hood has a West Bend like look to it but it's different enough, especially in the front, to see it's a different motor. My EDIT didn't work. Confirm should say 1960, got my years mixed up in my head. Lots of things get mixed up or lost up there. Let the insults begin. Yikes,a bushing motor? Is that common? Ill be careful with it. Hoping to get it to a collector. I gotta run it though. It would be silly to not experience such a unique gadjet in seemingly working condition. serial number 110019 sais j6 on the tag,, so confirmed, 1960 j6. Found a couple pictures on google. This ones missing the black and red stickers on the side. Anybody else run these? #19 off the line, and sales discontinued in may 1960,,,, def one of the last ever! Cool. Bushing motors are very common. The main disadvantage seems to be that they need a lot of oil. Maybe not as much as originally specified, as back then they usually used 30 wt. motor oil, but still much more than roller bearing or "fully jeweled" (Mercury marketing jargon) motors. I believe Mercury was about the only brand that were roller bearing across the line, at least from about 1948 on. OMC were roller on usually the bigger models and bushing on the lower ones, at least during this time. As far as how much oil, you will get many different opinions, even on roller motors, so I'll not go there.